Brevegen is a road leading from the Breheimsenter approximately 3km to Nigardsbreen car parking area. The road travels through moraine fields made by the glacier over the last 250 years. 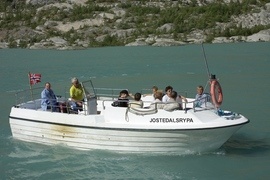 From the parking place there is a boat (Jostedalsrypa) that takes you over the lake toward the glacier or you can take the path leading around the lake, both meeting and leading you toward the glacier front. The boat goes back and forth over the lake each day between the hours of 10am and 6pm.